A satin white Regency styled wood floor lamp table with thick Carrara marble base and gold braided tassel lamp pulls, brass accent piece to the upper shaft. Retains the impressed mark to the base "Parzinger Originals". The measurement for the marble base is 14" L x 14" D, the shade size is 18" L x 18" D.
A few small chips to the edge of the marble base typical for this type of item that is vintage . A walnut floor lamp with brass accents attributed to Tommi Parzinger manufactured by the Danville Lighting company. 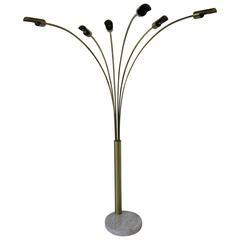 A six adjustable armed spray arc floor lamp with cylinder styled light fixtures, round white veined thick marble base and finished in a brushed brass with foot switch. Floor lamp by Tommi Parzinger. Reference (design): Modern Americana: Studio Furniture from High Craft to High Glam, Lovine and Merrill, pg. 180. 2 available, priced each. Wonderful vintage Tommi Parzinger floor lamp. In great vintage condition. Classic and elegant floor lamp, in the form of a traditional candelabra by Tommi Parzinger. Executed in bronze and steel, this example exhibits a wonderful patina. Tommi Parzinger floor lamp table by Parzinger Originals. Rare floor lamp by Tommi Parzinger for Lightolier. Six-arm, nickel-plated steel, trident-style with original shades. 1960s limited production in fantastic condition.